Ryan Betts, Cloud Solutions Architect: Office 365 Remote Mailbox Moves Fails with "MigrationTransientException: The call to EWS failed because no service was listening on the specified endpoint. There was no endpoint listening at EWS/mrsproxy.scv that could accept. The remote server returned an error (404) not found." Office 365 Remote Mailbox Moves Fails with "MigrationTransientException: The call to EWS failed because no service was listening on the specified endpoint. There was no endpoint listening at EWS/mrsproxy.scv that could accept. The remote server returned an error (404) not found." This issue is caused by an ExchangeGUID mismatch between your on prem and Azure AD user objects. It is easily resolved using PowerShell. In my example it was because the ExchangeGUID in the cloud was not the same as the one for the on prem mailbox. I knew the hybrid and EWS was functioning correctly as it was allowing me to migrate certain mailboxes, it was only some users that would fail with this error. Open the Exchange Management Shell from the on prem server and run the following command to find out what the on prem Exchange GUID is. As you can see in my example the Exchange GUID's are in fact different. From the Exchange Online session use the following command to manually set the GUID to match the on prem one. 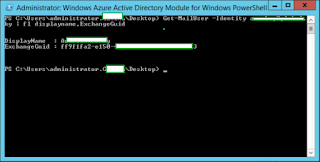 Once this command completes you can use the Get-MailUser command again to check the changes have been written to Azure AD.